It has been my experience that restaurants (and people) get in omelet ruts. There is always a mushroom one, something with peppers, and probably a ham and cheese. In my almost thirty years on this planet, I have a really hard time coming up with omelet recipes that A) I haven’t had and B) are still worth having. But this guy… this guy here… he’s unique. The flavors are intense and very fall-ish. It’s damn near a pie filling actually, but then it takes a savory turn thanks to some blue cheese and chives. 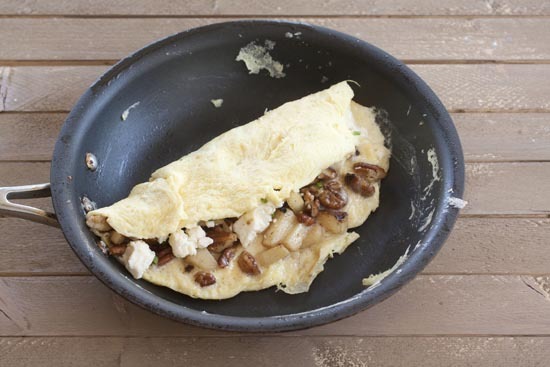 If anybody has had this Apple Pecan Omelet before, I’ll eat my shoe (not really… my shoes are gross). 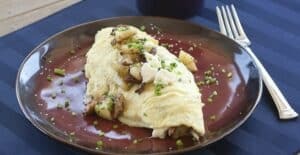 It sounds kind of out there, but this Apple Pecan Omelet filled with butter-sauteed pecans, apples and salty blue cheese is delicious! 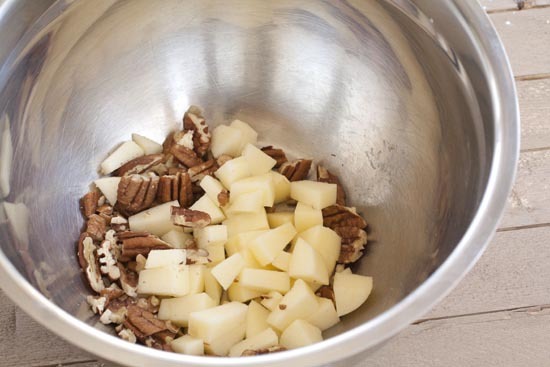 1) Peel and chop apple and chop pecans well. 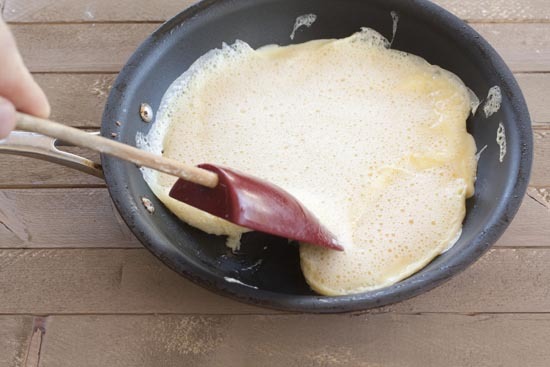 2) Add two tablespoons of butter to a small omelet pan over medium heat. Once melted, add apples and pecans and tiny pinch of salt. 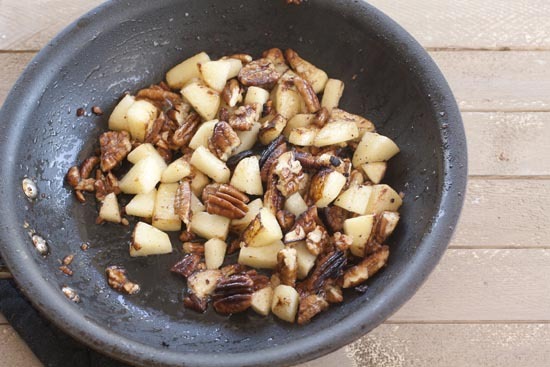 Sautee until soft and the pecans are slightly toasted, about three minutes. 3) Remove filling from pan and wipe the pan clean. Chop chives, crumble cheese, and whisk eggs. 4) Add 1/2 tablespoon of butter back to the pan and let melt over medium heat. Once melted, add two whisked eggs to the pan. 5) Use a sturdy plastic spatula to push the cooked eggs to the center of the pan and let the uncooked eggs flow to the outside. Continue to do this until most of the egg is cooked. It should only take a minute or two. 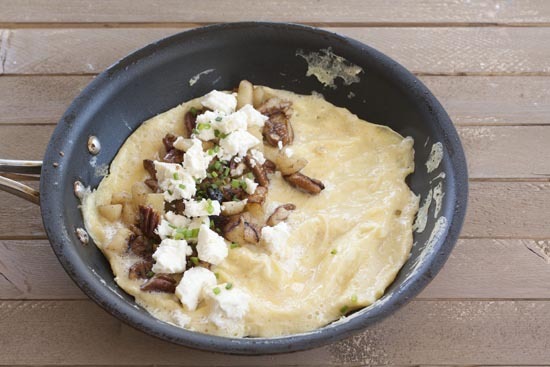 6) Once most of the egg is cooked and there is just a tiny layer of uncooked egg, add fillings to half of the egg (apple, pecans, blue cheese, chives). Also season with salt and pepper. 7) Gently fold omelet over so the eggs cover the filling. Return to heat and cook for another 30 seconds. 8) Fold omelet out onto pan and garnish with chives and extra fillings. Serve immediately! I have to give at least 75% of the credit for this recipe to my Flavor Bible. I wanted to do an omelet with blue cheese basically and just searched for ingredients that went well with it. I ended up with pecans and then apples and the rest is history. Kind of like a pie? 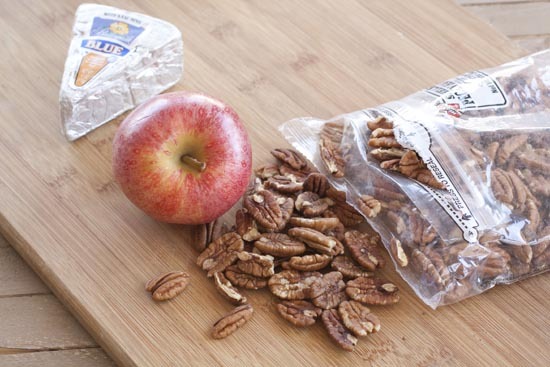 Peel, seed, and chop your apple and then chop your pecans as well. 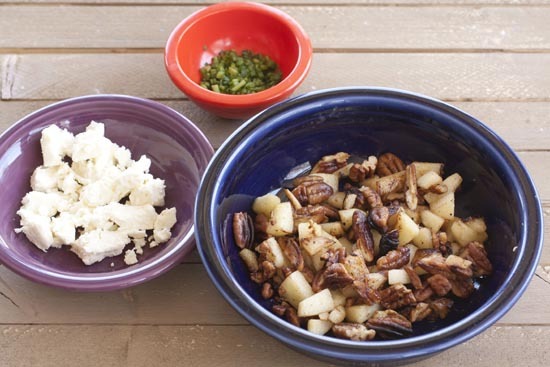 The one and only thing I would change for this recipe is to chop the pecans more than I did. They were a bit too chunky in the final omelet. Once you have them chopped, add a few tablespoons of butter to your omelet pan and cook the apples and pecans over medium heat until the apples are slightly soft and the pecans are toasted. Just a few minutes will do the trick. Not only will this combine the flavors, but it will also make it more of a filling rather than just raw ingredients. Besides that you just need some crumbled blue cheese and some chives and you’re ready to go! I used to be super-intimidated by making omelets. If you’re new to cooking, they seem a bit mysterious. But you can do this. Step one is to make sure you whisk your eggs really well. Like… beat the hell out them. Then add a small dab of butter to your nonstick omelet pan over medium heat (I always use butter. I don’t see any reason to change a good thing here). Once your butter is melted, pour in about two eggs worth of scrambled eggs. Let the eggs start to cook and as they cook, use your spatula to push the cooked eggs to the center. Tilt the pan and the uncooked eggs will flow to the outer parts of the pan and start to cook. Once most of your egg is cooked, you can move ahead. Don’t wait until your egg is 100% cooked or you’ll overcook the omelet. There should still be a very tiny layer of uncooked egg on the surface. You can see it shimmer in the below photo. Then just pile on your toppings to one half of the omelet. When I say pile, I don’t actually mean pile. If you PILE then it’ll be hard to fold the omelet. Then just use your spatula to fold half of the omelet over the other half. Return this to the heat for about thirty seconds just to give it a chance to cook a bit longer and let the cheese start to melt. When you’re ready to plate, try to “roll” the omelet out of the pan. This isn’t essential, but does help with the presentation. Basically, you want the hottest part of the omelet, the part touching the pan, to end up on top of the omelet. Generally, you can just kind of roll the omelet out of the pan and it works out. 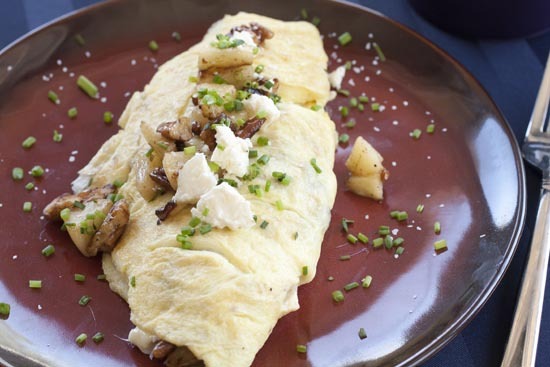 Once the omelet is on the plate, garnish it with chives, and some extra filling ingredients and you’re all set! I demolished this about two seconds after this photo. This was a really solid omelet and not like any omelet I’ve ever had. The filling is slightly sweet, but then the blue cheese smacks you in the lips. If you aren’t a blue cheese fan, you could also try this with goat cheese I think. I’ll be the first to admit that it’s kind of out there, but this Apple Pecan Omelet turned out to be really delicious. Wow!!!! That idea really looks good. I like all the ingredients. The only thing I would add is cooked crispy bacon pieces. Thanks, now that apple season is here I’ll be trying this. This is a great idea, breakfast and dessert in one. Thumbs up for creativity! Not a fan of bleu cheese, not sure about goat chz. Would mascarpone go well with this? We do not like blue cheese. Would any other cheese do? what about ricotta cheese? Yep. It’s pretty flexible! should work with lots of different cheeses. “…a Strange Filling About This!” This makes me giggle. Thanks for the humor; it’s fun!